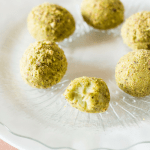 Sink your teeth into these Creamy White Chocolate Pistachio Truffles with a Healthy Twist. The perfect decadent yet relatively guilt-free treat for anyone. Perfect to give as a homemade gift too. I have had this recipe in my head FOREVER now, and the one day I finally get a chance to get in back in the kitchen and do some experimenting I discover someone (not naming any names….but they know who they are) had eaten all of my white chocolate and put an empty wrapper back in it’s spot. I may have muttered a few choice words under my breath…. Moving on….to these amazingly creamy White Chocolate Pistachio Truffles. These little bites of deliciousness are so so good! I used avocado to make them super creamy and give them a great green color for the Holiday season, and to match the crushed pistachios surrounding the outside. Don’t let that put you off though – if you have never tried avocado in a chocolate based dessert, you are in for a treat! Don’t believe me? Check out these Chocolate Raspberry Truffles which are one of the most popular recipes on my site (and just happen to use avocado as the main ingredient as well). These truffles will please young, old, fancy and fussy alike. My kids loved them, my non sweet-tooth dad loved them and my incredibly sweet-toothed teenage brother loved them (which actually surprised me to be honest). They are healthy, but taste super decadent, sweet but free from refined sugar (obviously depending on the brand of white chocolate you buy), festive but not loaded with candy canes and food coloring. Pistachio truffles are my favorite. I love the sound of these and would love to try them. I made an avocado ice cream a few years ago so I know that it works superbly in sweets, I love the idea of combining with white chocolate and pistachios. Avacado in truffles is something new to me. Intriguing. But truffles at Christmas time, perfection. The are gorgeous! I’ve had that same experience of having a recipe in my mind for a while before actually getting to try it. This one looks like a huge success! I love pistachio!! I bet it would go amazing with white chocolate. What a great combo especially for the holidays! Thanks Sophia! We have been eating pistachio everything lately 🙂 so yummy! Oh my! All this goodness in one bite.